Robotics Business Review covers the latest robot news, including developments in artificial intelligence, industrial automation, and self-driving cars. Readers will learn about new technologies, companies, and industrial trends. Teachable robots, collaboration, and mobile connectors make some noise. 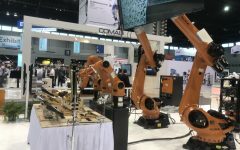 Automate 2019 announcements also include low-cost 6-axis model, updated LS Series. Why artificial intelligence is not only important for robotics, but other areas and markets as well. Following this announcement and other successful trials, AD Navigation places a production order for the MEMS gyro. Safety and security options tested in Netherlands competition where drones battled each other. New platform facilitates customizable implementations of real-time visual intelligence technology, extending operational capabilities for industrial and commercial uses. Robot density in U.S. manufacturing now more than double of China.